Campus generators of hazardous chemical waste, are responsible for ensuring that they and any staff or students working under their supervision follow regulatory requirements and University guidelines concerning management and disposal of hazardous waste. The following summary outlines the steps to take to comply with the University’s rules on managing hazardous chemical waste. They are presented to give you a better understanding of how to manage your chemical wastes. A detailed description of each step can be found by following the appropriate link. Fact sheets providing additional information can be found at the Minnesota Pollution Control web site at http://www.pca.state.mn.us/waste/pubs/business.html. Step 1: Comply with information and training requirements in accordance with regulations. Step 2: Inventory wastes generated and determine if they are hazardous. Step 3: Collect wastes in sturdy, leak-proof containers. Step 4: Complete and attach a label to each waste container. Step 5: Store waste containers with secondary containment such as on a tray or in a tub. Step 6: Contact Dale Dreyer to have waste containers removed by calling 755-2780. Bemidji State University is a very small quantity hazardous waste generator (VSQG), according to the definitions in the state hazardous waste regulations found in Minnesota Rules, Chapter 7045. VSQGs have no specific training requirements under the hazardous waste rules. However, any employees working with chemicals or chemical products must be provided training and information according to the requirements of the Minnesota Occupational Safety and Health Agency (MnOSHA) Employee Right-to-Know standard, Minnesota standard, chapter 5206. Also, MnSCU requires training for any employees and students who are involved in any aspect of generating or managing hazardous waste, including as part of classroom or other course work activities. Laboratory workers are not covered by the State’s Right-to-Know standard, but must be provided similar training and information in accordance with the Federal Occupational Safety and Health Administration (OSHA) standard 29CFR1910.1450, Occupational Exposure to Chemicals in Laboratories. Student workers, graduate assistants, paid interns and student mentors, and all others receiving compensation through the University’s payroll system, are considered employees and are subject to the training requirements. It is highly recommended to also train students and other non-employees who may be working with any chemicals or chemical wastes. Employee training must be documented in writing and be available for review by regulatory agencies. Federal OSHA regulations require that employees be provided information and training on their responsibilities and expected actions in emergency situations. When planning for the possibility of a chemical spill, you will need to determine what size and type of spill can be handled routinely and what size and type of spill becomes an emergency. Workers should be trained in spill cleanup procedures for routine chemical spills. If an emergency size/type of chemical spill occurs, specially trained spill-response workers must handle the emergency. For these kinds of spills the department emergency plans will likely involve evacuating workers from the spill area and calling for outside chemical spill-response assistance. However, individuals who are likely to witness or discover a spill must be trained at least to an awareness level, which includes knowing how to recognize associated hazards, how to initiate an emergency response according to the department’s plan, and what actions to take, if any, until a spill response team arrives. Contact EHS for more information and assistance in complying with these requirements. 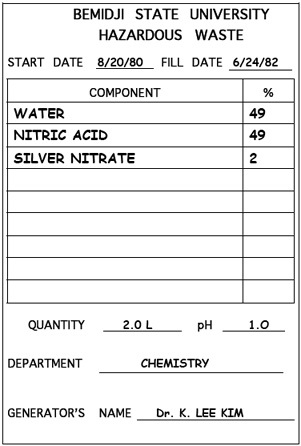 “F” Listed Wastes – These wastes are typical of those generated in chemical laboratories. They include spent or used solvents and solvent mixtures. “P” Listed Wastes – These wastes are discarded commercial chemical products, off specification chemicals, containers with residual, and spill residues containing any of the listed substances. The listed compound must be 100 percent of the waste or be the sole active ingredient to be considered a “P” list hazardous waste. “U” Listed Wastes – These wastes are listed due primarily to their toxicity, but are less toxic than those listed on the “P” list. They may have additional hazard characteristics, as well. Included as wastes are discarded commercial chemical products, off specification chemicals, containers with residual, and spill residues containing any of the listed substances. The listed compound must be 100 percent of the waste or be the sole active ingredient to be considered a “U” list hazardous waste. This information can usually be found on Material Safety Data Sheets (MSDS) supplied by the manufacturer. All the chemicals listed on the “F” and “P” lists in the appendix meet the characteristics for lethality. Ignitability – defined as a liquid with a flash point below 100 degrees F (38 degrees C) or a solid which can through friction, absorption of moisture or spontaneous chemical changes, catch fire and burn so persistently that it represents a hazard. Examples include mineral spirits, paint thinners, spray paints, and gasoline. Oxidizers – supply oxygen to a reaction or fire. Oxidizers include but are not limited to oxides, organic and inorganic peroxides, permanganates, chlorates, perchlorates, persulfates, nitric acid, organic and inorganic nitrates, iodates, periodates, bromates, chromates, dichromates. Bromine, chlorine, fluorine and iodine are also considered oxidizers. Hydrogen peroxide, sulfuric acid, and oxygen are examples of oxidizers that can be found on campus. Corrosivity – defined in state and federal regulations as aqueous solutions with a pH less than or equal to 2 or greater than or equal to 12.5 or is a liquid capable of corroding steel at a rate of 1/4 inch/year. Note that City of Bemidji ordinance #30 prohibits the sewering of wastes having a pH less than 5.5 or greater than 9.5. Examples of corrosives used on campus include nitric acid and ferric chloride etching solution, high acid bowl cleaners and battery acid. Reactivity – defined as wastes that are unstable or explosive, react violently with water, or can release toxic vapors, such as hydrogen cyanide or hydrogen sulfide. Other examples include sodium, lithium, and potassium metals, anhydrous aluminum chloride, sodium cyanide, acid chlorides, and picric acid. -Oral LD50 less than 500 mg/Kg. -Dermal LD50 less than 1000 mg/Kg. -Inhalation LC50 less than 2000 mg/m3 for dusts and mists. -Inhalation LC50 less than 1000 ppm for gases and vapors. Toxicity Characteristic (TCLP) – wastes containing certain toxic metals or organics of special concern in regard to ground water contamination. A waste containing any of the chemicals on the TCLP list, at or above the listed hazardous concentration level, are hazardous wastes. Generators may not dilute waste in order to reduce the hazardous concentration level. Follow the link below to access a list of the TCLP chemicals on page four of a fact sheet from the Minnesota Pollution Control Agency. It is the individual generators’ responsibility to insure accurate identification of wastes. Anticipated waste products should be identified before waste generating activities begin. Instructors are responsible for identifying wastes generated by students’ class activities and other assigned projects. “Unknown” wastes will require analysis, which will be conducted at the generating department’s or college’s expense. It is advisable to maintain a waste container log, in cases where a single waste container is used to collect wastes generated by different individuals or where wastes vary in make-up. The log should include the amount of waste being added and the percentage of each component in the waste. To complete Step 2, carefully review all departmental activities that generate waste materials. List those materials and determine if they are hazardous wastes. There are a number of resources that can help make that determination. 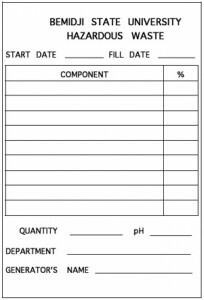 Material Safety Data Sheets (MSDS) provide information on the chemical and physical characteristics of products and safety and waste handling procedures. Manufacturers are required to provide MSDSs to all customers. Employers whose employee’s use chemical products are required to have MSDSs for those products readily accessible at the work site. The MSDSs must be included in the training and information requirements discussed in Step 1. Many manufacturers have MSDSs and other useful information available on the Internet. Product labels my also provide useful information, though it is usually less extensive than that in MSDSs. A decision guide for determining if a waste is hazardous is available by clicking on the link below. When possible, should be made of breakage resistant materials such as plastic, metal, or plastic coated glass. Sealable plastic bags may be used but should then be placed in a rigid, leak-proof, over-pack. Containers holding hazardous waste must be kept closed except when waste is actually being added or removed. Containers may be left open during a work period if doing so does not present an exposure hazard from evaporating vapors. The container must be closed at the end of the period. It is recommended that transparent or semi-transparent containers be used, when possible, to help prevent overfilling. This is especially a concern when several people are using the same container. Overfilling can also be controlled by limiting access to the container and allowing only the instructor or some other designated individual to add waste. Waste containers must also be placed on a tray, in a tub, or have some other secondary containment in use. Do not fill liquid waste containers completely to the top. Leave a small amount of head-space to allow for expansion of the liquid due to temperature changes. Leaking containers will not be accepted. The waste should be placed in a different container or the leaking container and its contents may be placed in an appropriate over-pack. Contact Dale Dreyer for assistance in handling leaking containers. The exterior of the container must be clean and free of spilled waste material. Original label – Unused or outdated laboratory chemicals or commercial chemical products that are in their original containers and bearing legible, original manufacturers’ labels identifying the contents, may be submitted for waste pick up as is. 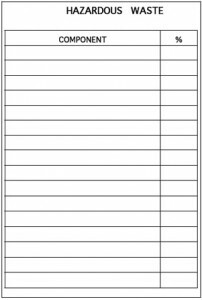 A Material Safety Data Sheet must accompany commercial products. The amount of waste in the container must also be provided. BSU Hazardous Waste Label – Other containers used to collect waste must use the hazardous waste label provided by EHS. A copy of the label is shown below. All label information must be completed. Since it may be difficult to add information to the label once it is on the container, a general label describing the waste may be used initially. In this case, a log of all wastes added to the container must be maintained and readily accessible. 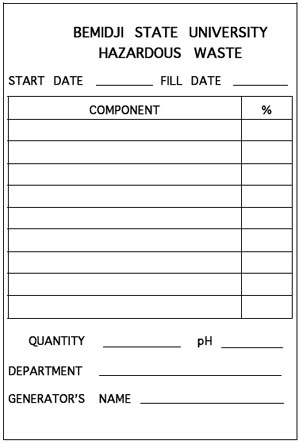 A complete label, made using the information from the waste log, should be attached to replace the initial label when the container is full. Contact EHS to obtain labels. Attach the label to the container as soon as waste accumulation begins. Record the waste accumulation start date. 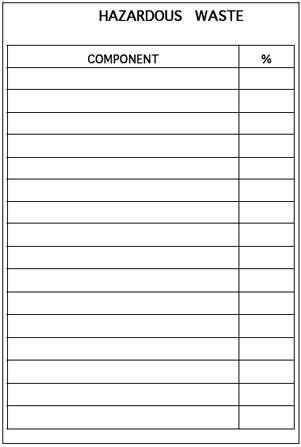 As waste is added, maintain a separate log recording each waste component and amounts added, including water. When the container is full, use the information from the log to complete the label as described in the Label Explanation section. The date waste is first added to the container. The date the container is filled. The container must be moved to central storage within three days after this date. List each component in the waste. Do not use abbreviations or chemical formulas. 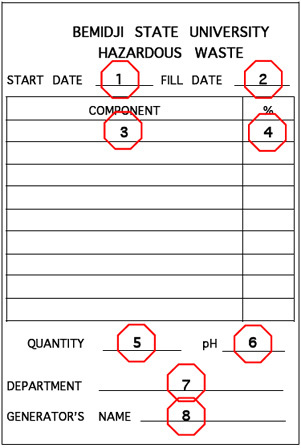 Water must be listed as a separate component when present in the waste. An additional label may be attached if more space is needed. This part may be completed after the container is filled, using the waste log information. Percent by weight of each component waste is preferred. Percent by volume will be accepted. The sum of all components must equal 100%. 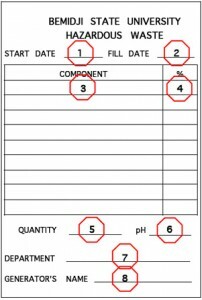 This part may be completed using the waste log information, after the container is filled. Total quantity of waste in container. pH of solutions that are 10% or more aqueous. This should include the name of the class or activity generating the waste. This must be the name of the regular employee responsible for generation of the waste. Students and student employees may not assume responsibility for hazardous waste. Review the properly completed example label below, or contact EHS if you have questions about how to label hazardous waste containers. Wastes must be stored in appropriate containers as described in Step 3. Containers must be labeled correctly as described in Step 4. Waste containers must be stored on an impermeable containment surface such as a tray or tub. Waste containers must be located in the work area of the specific process producing the waste. Direct control and visual inspection of the satellite area is the responsibility of the person(s) operating the process, typically an instructor. No more than 55 gallons of non-acute hazardous waste may be stored at the satellite site. No more than one quart of acute hazardous waste may be stored at the satellite site. Waste containers must be removed from the satellite storage site within three days of being filled. Hazardous waste will be removed by EHS and be stored at the University’s central waste storage site, until it is transported to a hazardous waste facility. Please note that only wastes that are properly identified and labeled and in appropriate containers can be accepted. Contact Dale Dreyer at 755-2780 to make arrangements for waste pick up.